Novel technologies have been developed recently to assess contact between the ablation catheter and the underlying tissue in an attempt to improve safe and effective lesion delivery. The most recently developed technology is the SmartTouch™ catheter which is an open irrigated-tip catheter integrated within the CARTO 3 3D mapping system. In this review we consider the role of contact force technology, evaluate the published data and discuss the potential applications of this novel technology. The publication of this article was funded by Biosense Webster. Over the last 30 years, the role of catheter ablation for treating a wide range of arrhythmias has increased dramatically. The electrophysiological substrates of the more straightforward arrhythmias (such as atrio-ventricular reciprocating tachycardia and atrio-ventricular nodal re-entry tachycardia) have now been well defined and excellent long-term success rates can be achieved at minimal risk.1,2 Other more complex substrates however, such as atrial fibrillation (AF) or ventricular tachycardia (VT), have proved more difficult to treat effectively and our ability to achieve long term freedom from arrhythmia for patients has been limited.3,4 A critical principle of catheter ablation is to achieve permanent transmural conduction block whether it be targeting pulmonary vein isolation, linear block between two anatomical structures or a critical isthmus of slow conduction within an area of scar. While conduction block (and therefore immediate procedural success) is often achieved in the short term, gaps in lines of block are responsible for procedural failure in many types of arrhythmias, or may serve as a substrate for new arrhythmia mechanisms. Furthermore, some anatomical locations are particularly difficult to ablate, such as the lateral mitral isthmus of the left atrium5 and it can be challenging to achieve permanent conduction block. Fundamental to effective lesion delivery is ensuring adequate contact between the catheter-tip and the tissue. Conventionally, this has been assessed by the operator using a combination of factors including local electrogram attenuation, fluoroscopic appearance of the catheter tip against the wall of the chamber, tactile feedback from the catheter tip and observing an impedance drop during energy delivery. More recently, new technologies have been developed to allow real-time estimation of contact force, providing the operator with an accurate quantitative assessment of tissue contact. These breakthrough technologies are providing new insights into how best to deliver effective permanent ablation lesions and will hopefully lead to enhanced patient safety and improved success rates in the near future. There are currently three such technologies on the market. The first uses a fibre-optic sensor mounted within a 3.5 mm open irrigated-tip ablation catheter which detects changes in contact force (TactiCath®, Endosense, SA) and displays real-time values on a dedicated workstation. This technology was the first on the market and represented a major advance by allowing the operator to measure contact in real-time during ablation and therefore assess the likely effectiveness of the ablation lesion. Key features of this technology include an assessment of both axial and lateral contact, assessment of force over time, a sensitivity of less than 1 g and proven safety record.6 Ongoing trials will provide new data regarding the safety and effectiveness of the technology.7 IntelliSense® (Hansen Medical Inc., Mount View CA, US) is another contact force technology incorporated into a robotic catheter navigation system. This system provides both visual and vibration feedback when contact forces are excessive. More recently, a novel ablation catheter, SmartTouch™ (ThermoCool SmartTouch™, Biosense Webster Inc., MA, US) has been launched providing real-time contact force data on an integrated platform and forms the basis of this review. The SmartTouch™ catheter is a 3.5 mm tip, externally irrigated catheter available in bidirectional and unidirectional platforms (see Figure 1). A precision spring is mounted within the tip of the catheter that allows a small amount of electrode deflection and is connected to a transmitter coil which emits a location reference signal. Location sensor coils are also mounted within the shaft of the catheter and detect this signal thereby monitoring small movements of the spring and allowing precise tracking of the catheter tip. These movements are sampled every 50 ms and calibrated to produce a contact force reading (in grams) that is averaged over 1 second. The readings are accurate to within 1 g. The catheter needs to equilibrate to body temperature within the blood pool which is achieved within 15 minutes. The catheter connects to the patient interface unit and is fully integrated within the CARTO 3 3D mapping system (Biosense Webster, Inc., MA, US). 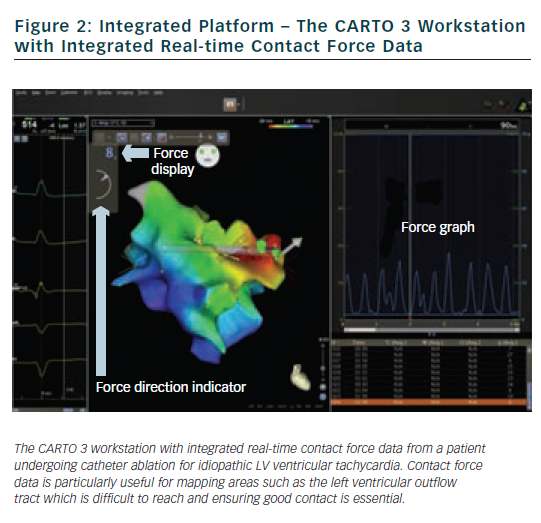 The Carto 3 interface provides real-time contact force data in a number of different formats (see Figure 2). The numerical contact force (averaged over 1 second) is displayed and updates every second. A real-time graphical representation can be displayed and the operator can also see the direction of the force vector which is displayed as an arrow head. A number of display parameters can be altered according to operator preference. Minimum and maximum acceptable contact force levels can be programmed with a flashing warning screen when excessive forces are recorded. A key feature of the SmartTouch is that it is fully integrated within the CARTO 3 3D mapping platform. The operator can assess not only the real-time contact force data during ablation, but also assess catheter position, power, temperature and impedance data and review mapping and reference electrograms on a single screen. Contact-force technology is providing new insights into some of the technical considerations of catheter ablation. 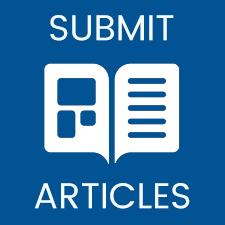 It is well established that pulmonary vein isolation is fundamental to the success of catheter ablation in patients with paroxysmal AF and it is also well recognised that pulmonary vein reconnection counts for most recurrences. As adequate contact is fundamental to producing permanent, transmural ablation lesions, contact force technology is likely to help to limit the delivery of lesions associated with poor contact. It is well known that certain anatomical regions are harder to reach and are associated with worse catheter stability (anterolateral tricuspid valve annulus, basal left ventricular wall, etc), and therefore are likely to be associated with sub-optimal catheter contact. Similarly, in patients undergoing pulmonary vein isolation, areas of low contact may be associated with a higher rate of reconnection. The inferior aspects of both left and right pulmonary vein antra were associated with lower mean contact force measurements in 19 patients undergoing pulmonary vein isolation for paroxysmal and persistent AF.8 Furthermore, three patients had early reconnection (within one hour), two of whom had reconnection at the postero-inferior aspect of the right sided veins and one had reconnection of the antero-inferior aspect of the left sided veins. Future studies may demonstrate whether certain catheter configurations are better or worse than others for reaching certain anatomical regions – e.g. whether better contact is achieved using a transeptal or retrograde aortic approach to reach the basal left ventricular wall, but such data are lacking currently. A further advantage of real time contact force recordings is during mapping. Current technology allows operators to generate rapid detailed anatomical maps of the chamber of interest but can be misleading due to the creation of false space and tenting during mapping. By ensuring that contact forces are not excessive during the creation of the geometry, this potential problem can be minimised. Conversely, when mapping within the left ventricle in patients with structural heart disease, the true endocardial border can be difficult to determine sometimes, if only using traditional markers of contact (fluoroscopic appearance, electrogram appearance etc) and distinguishing between anatomical scar and poor contact becomes much more straightforward with contact force technology. The optimal contact force range for catheter ablation has yet to be determined in humans but a range of pressures that result in perforation has been defined in pig hearts. Data from 111 perforations revealed a mean contact force of 175 g (77–376) immediately prior to perforation. The force required to cause perforation was significantly lower after energy delivery (mean 150 g), however, than during mapping alone (197 g). There were no differences in the perforation force comparing left atrial and right atrial ablation.10 To what extent this data can be extrapolated to humans remains to be seen and the significance of catheter orientation, use of long sheaths and the risk of perforation at various contact forces in specific anatomical areas (e.g. posterior wall compared to the anterior wall of the left atrium) is unknown. Defining the range of effective, yet safe contact force readings remains to be determined. Data from the TOCCATA study (using the Endosense fire-optic sensor technology) revealed a range of contact force readings from 8 ± 8 to 60 ± 35 g for right atrial ablation and 12 ± 10 to 39 ± 29 g for left atrial ablation with significant inter-operator variability seen. It is likely that the effective, safe contact force range will depend on a number of additional factors including the substrate, the anatomical location of the ablation lesion, whether ablation lesions have already been applied to that area and the power and flow settings for the catheter. Like any new technology, operators will require time to become familiar with contact force data and how to best incorporate these data into their practice. In our experience there are a number of advantages to using this technology. 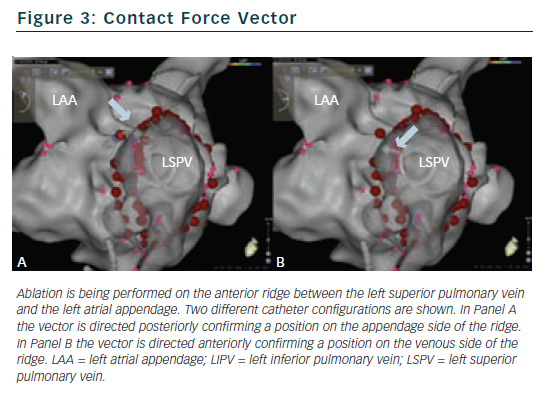 Understanding the force vector is of particular benefit when ablating on and around the intervenous ridges or anterior ridge between the left superior pulmonary vein and the left atrial appendage. The direction allows the operator to define the exact relationship between the catheter tip and the surrounding structures and allows precise micro-movements of the catheter to optimise the ablation target (see Figure 3). Another advantage occurs when trying to target gaps in linear ablation lines if several ablation lesions have already been applied. In this situation, superficial oedema may result in no recordable signal at the distal electrode pair despite electrical breakthrough in deeper tissues. Mapping either side of the line can localise the breakthrough to a particular point, and if adequate contact is obtained, ablation at this site can result in transmural block despite no recordable signal at the successful ablation site. We have found that isolation of pulmonary veins is more frequently achieved with wide area circumferential ablation without having to resort to ostial segmental ablation using this technology. This has resulted in a change in our practice. Where previously we would have performed figure-of-eight lesions around ipsilateral veins with ablation along the intervenous ridge, we now are able to isolate ipsilateral veins with antral wide area ablation. There is no consensus about the optimum range of contact forces to achieve safe, effective lesions. In general we try to maintain a minimum contact force of 10 g and maximum of 20 g. Our early experience in patients undergoing catheter ablation for AF suggested that rapid signal attenuation could be achieved over a wide range of contact force readings and that it was only lesions with very low contact force (<5 g) that were not associated with >50 % signal attenuation (unpublished data). We have found the excessive force warning particularly useful allowing us to adjust the contact force during mapping or ablation and typically use an excessive force warning of 50 g.
We have observed that contact force can vary during a burn – despite no noticeable change in other subjective measures of contact such as fluoroscopic appearance or impedance drop – allowing the operator to make micro-adjustments to improve contact and maintain adequate contact throughout the energy delivery. This is likely to improve the effectiveness of the lesion and should reduce the number of inadequate ablation lesions. Another useful feature is the ability to review a force map for existing ablation lesions. Having performed a line of ablation lesions it is possible to review the mean contact force (averaged over 2.5 seconds each time a lesion is tagged) for each lesion which can help determine areas of good and bad contact, and therefore target areas that may need further energy delivery to achieve conduction block. This can also be done in real time. Figure 4 shows an example of a patient who underwent wide area circumferential ablation and underwent a further procedure five months later for AF recurrence. The left upper pulmonary vein had reconnected and required a single lesion on the anterior-superior aspect of the anterior ridge. 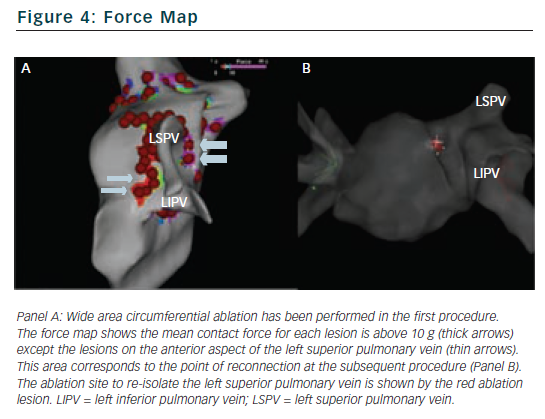 On reviewing the force map from the original procedure it was apparent that the point of reconnection corresponded to an area with a lower mean contact force (2 g) compared to other ablation lesions (>5 g). Whether this observation is a consistent one remains to be seen.8 Preliminary data suggests that areas of early reconnection (within one hour) may be associated with lower contact forces during energy delivery.8,12 Furthermore, while this information is useful, an indication of contact force throughout the duration of the burn (either mean contact force or force-time integral) rather than reflecting 2.5 seconds around the point of tagging the lesion would be more helpful. One further observation from our centre is that there seems to be a significant variability in typical contact forces recorded by different operators, both amongst senior operators and trainees. This has also been observed in other centres using a different technology.4 Each operator has also noticed unexpected high contact force recordings occurring at a time when conventional parameters would not have indicated excessive force. This affords the opportunity to individual operators to modify their own ablation technique using the feedback from the contact force recordings. The accurate assessment of catheter contact has long been a goal for electrophysiologists and we have used a number of surrogates to determine whether our catheter is in adequate contact or not. These surrogates are imperfect and we are learning that simple measures such as electrogram attenuation are often misleading. It is likely therefore that integrated contact force technologies will become an established part of most if not all ablation procedures. Whether such technologies affect hard clinical endpoints (such as success rates, complication rates, or mortality) remains to be seen but trials are ongoing in this field. The TOCCASTER study7 is randomising patients with atrial fibrillation to catheter ablation with the TactiCath contact force catheter versus standard ablation catheter and will assess safety and effectiveness. The TOCCATA-Touch+ study is examining the safety of the TactiCath catheter in both atrial fibrillation and right atrial arrhythmias. Our group is examining the relationship between contact force and electrogram morphology in patients with atrial fibrillation (Clinicaltrial.gov ref NCT01587404) and how this impacts on our ablation strategy. Contact force assessment represents a breakthrough technology that is likely to impact significantly on how we perform catheter ablation. It promises to improve procedural success by ensuring adequate catheter contact and therefore the delivery of more effective ablation lesions while also warning operators of the dangers of excessive contact and therefore potentially reducing complications. Time will tell whether these promises are fulfilled but the next few years represents an exciting time in the field of complex ablation. Dagres N, Clague JR, Kottkamp H, et al. Radiofrequency catheter ablation of accessory pathways. Outcome and use of antiarrhythmic drugs during follow-up. Eur Heart J 1999;20(24):1826–32. Deisenhofer I, Zrenner B, Yin YH, et al. Cryoablation versus radiofrequency energy for the ablation of atrioventricular nodal reentrant tachycardia (the CYRANO Study): results from a large multicenter prospective randomized trial. Circulation 2010;122(22):2239–45. Cappato R, Calkins H, Chen SA, et al. Updated worldwide survey on the methods, efficacy, and safety of catheter ablation for human atrial fibrillation. Circ Arrhythm Electrophysiol 2010;3(1):32–8. Kuck KH, Schaumann A, Eckardt L, et al. VTACH study group. Catheter ablation of stable ventricular tachycardia before defibrillator implantation in patients with coronary heart disease (VTACH): a multicentre randomised controlled trial. Lancet 2010;375(9708):31–40. Matsuo S, Wright M, Knecht S, et al. Peri-mitral atrial flutter in patients with atrial fibrillation ablation. Heart Rhythm 2010;7(1):2–8. Kuck KH, Reddy VY, Schmidt B, et al. 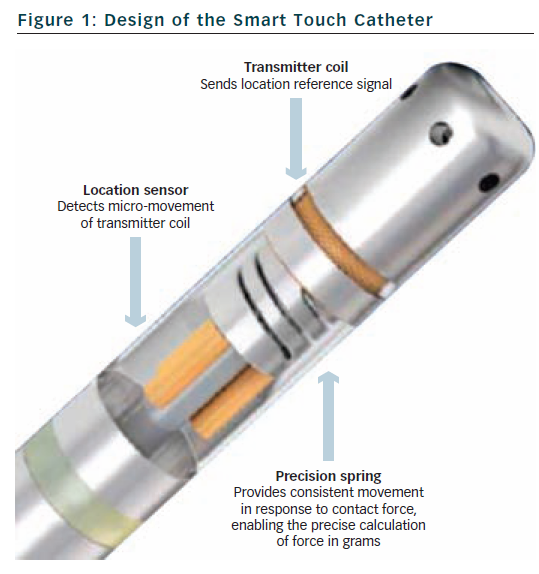 A novel radiofrequency ablation catheter using contact force sensing: Toccata study. Heart Rhythm 2012;9(1):18–23. TOCCASTAR – TactiCath contact force ablation catheter study for atrial fibrillation. ClinicalTrials.gov ref NCT10278953. http://clinicaltrials.gov/ct2/show/NCT01278953 (6 September 2012). Kumar S, Morton JB, Halloran K, et al. Effect of respiration on catheter-tissue contact force during ablation of atrial arrhythmias. Heart Rhythm 2012; [Epub ahead of print]. Yokoyama K, Nakagawa H, Shah DC, et al. Novel contact force sensor incorporated in irrigated radiofrequency ablation catheter predicts lesion size and incidence of steam pop and thrombus. Circ Arrhythm Electrophysiol 2008;1(5):354–62. Perna F, Heist EK, Danik SB, et al. Assessment of catheter tip contact force resulting in cardiac perforation in swine atria using force sensing technology. Circ Arrhythm Electrophysiol. 2011;4(2):218–24. Martinek M, Lemes C, Sigmund E, et al. Clinical performance of a new open-irrigated radiofrequency catheter with direct force measurement in atrial fibrillation ablation. HRS 2012. Jadidi A, Park CJ, Lehrmann H, et al. Adenosin-mediated acute pulmonary vein reconnection occur at regions of low contact force-time integral – a randomized multicentre trial. HRS 2012.